(Bloomberg Opinion) -- What’s an investor to do when a tech stock is no longer a tech stock? 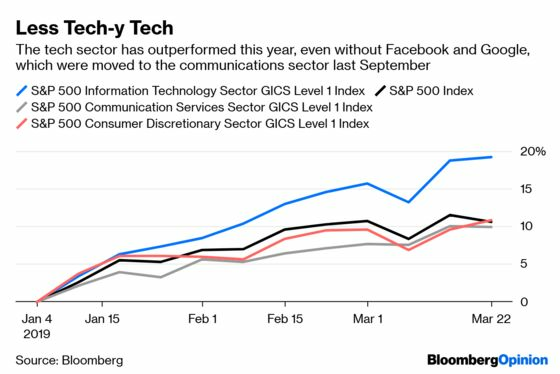 Six months ago, indexing giants S&P Global and MSCI jointly decided to break up the tech sector, moving some stocks out of the group that they classify as information tech. Alphabet and Facebook were reclassified from tech to the communication services sector. Netflix, previously in consumer discretionary, was also moved to communications. Amazon, on the other hand, stayed put. As such, the popular FAANG stocks, if Amazon is included for the extra “A,” span three different sectors. The split may make more sense than it sounds. Last July, when Facebook’s troubles became apparent and the social network stock’s skid was leading the rest of the market down, I argued that the broad sell-off wasn’t as odd as it seemed. Yes, Facebook was facing its own privacy issues, but technology as a portion of the economy was bigger than ever. So if there was an issue with tech companies, there was an issue with the economy. S&P and MSCI’s redistribution seems to have been motivated by a concern that the tech sector had taken over more of the market than it had of the economy. Soon before the changes, the tech sector, as it was defined at the time, accounted for close to 30 percent of the market cap of the S&P 500, at around its all-time high. S&P’s revised tech sector now makes up 21 percent of the market’s overall value. But the tech stocks that have been distributed to those other sectors tower over their new companions. 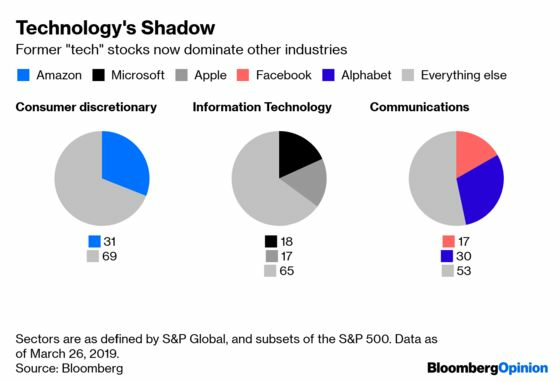 Alphabet and Facebook alone make up about 45 percent of the market value of S&P’s communications sector. Add in Netflix, and the trio jumps to nearly 52 percent. Amazon alone accounts for 31 percent of the consumer discretionary sector. This seems to be a pretty accurate picture of the economy. Tech hasn’t just become big, it has become a big part of every sector. That being said, the stocks that have been traditionally considered tech stocks also seem a little less tech-y these days. Apple’s big product introduction this week wasn’t some new device or software but essentially a credit card and television shows. Chipmaker Intel Corp.’s earnings, feeling the affects of the trade war with China, will be up only 4 percent. Also in the top six largest components of the sector that S&P now calls tech are credit card company Visa Inc., at third largest, and rival Mastercard Inc., at No. 6, both of which should arguably be considered financial stocks. The result is the expected growth rate of the S&P’s tech sector is just 5.9 percent this year. The communications sector, on the other hand, is supposed to be more than double that at about 12.6 percent. Tech stocks have also traditionally had relatively high profit margins. Yet this year, the profit margins of the S&P communications sector, based on earnings before interest, tax, depreciation and amortization, is expected to be 34 percent, compared with 32 percent for the tech sector. The one thing that does look most tech-y about the S&P tech sector is its valuation. The stocks in the group trade at an average 19.2 times earnings, despite the lower profit margins and growth. The S&P communications sector’s price-to-earnings multiple is 16.8. The takeaway for investors is that, just like in the economy, it will become increasingly difficult to separate tech from everything else.